36 Interesting Facts about YouTube: YouTube is the world's largest video sharing platform. Every internet user is familiar with YouTube, but there are so many interesting facts related to YouTube that you may not know about. 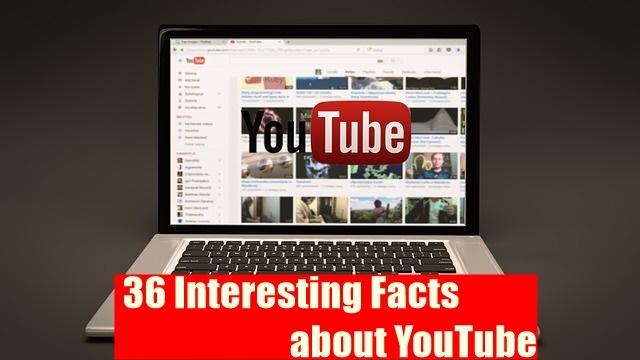 In this post, we will talk about these and learn about 36 Interesting Facts about YouTube. When YouTube was created, hardly anyone would have imagined that one day YouTube would be the second largest website in the world, but YouTube has a stalemate today. As you all know, YouTube is a website owned by Google, where you can view videos, share them, and create videos for yourself by uploading videos. 1. YouTube was created by Chad Harley, Steve Chen and Javed Kareem in 2005. 2. Before making YouTube, these three employees used to work in Chad Harley, Steve Chen and Jawed Karim Paypal. 3. There are two reasons for the idea of creating YouTube. One is that Harley and Chen were unable to share the dinner party's video due to email boundaries, and secondly when Javed Karim was unable to find any of Janet Jackson's videos online. In this way, they got the idea of making this video site. 4. The domain name YouTube.Com was registered on Valentine's Day i.e. 2005, i.e. 14th February. 5. This domain name of youtube.com has become the reason for Misunderstand with the domain utube.com of the Universal Tube and Rollform Equipment and people are searching for youtube.com at utube.com. Because of this, the company had to make utubeonline.com by changing its domain name. 6. The first video on YouTube was uploaded on April 23, 2005, at 8:27 PM In this 19-second video, YouTube co-founder Javed Kareem talks about elephant trunks. The title of this video was 'me at the zoo' and this video is still present on YouTube. 7. This first video uploaded on YouTube has 64 million views so far. 8. Google recognized the future of this video sharing website and purchased YouTube for $ 1.65 billion in November 2006. 9. YouTube is the second largest search engine in the world after Google. 10. Although YouTube is an American video sharing platform, 70% of its traffic comes from outside the USA. 11. The most viewed video on YouTube is Despacito. This is a music video that has 6.09 billion views. 12. The most watched video of the non-music category on YouTube is' Masha and the Bear - Recipe for Disaster Ep. 17 '. This is an animated video of 3.53 billion views in the Russian language. 13. If you talk about the most viewed videos on YouTube, then the music video is the most popular because of people like Entertainment category the most. 14. YouTube Rewind with more than fifteen million dislikes is 2018 most disliked video on YouTube. 15. Justin Bieber's baby song was the most dislike video before YouTube Rewind 2018 video. 16. There are over 1,000,000,000 views from mobile on YouTube in 1 day. 17. The longest video on YouTube is 596 hours 31 minutes and 21 seconds. You can watch this video by searching the longest video on Youtube on YouTube. 18. YouTube has started April Fools Pranks since 2008. In 2008, all the videos available on the main page were redirected to a music video that would open the music video when clicked on any video. 19. There were a billion scenes crossing video Gangnam Style on YouTube. This was the song of the South Korean musician Psy. 20. More than 300 hours of content is uploaded to YouTube in 1 minute. 21. YouTube is available in 89 countries and 76 different languages. 22. YouTube is the source of income for millions of creators i.e. they are earning money by working full time on YouTube. 23. T-series and pewdiepie on YouTube are the largest YouTube channel in terms of subscribers. 24. Batman is the most popular superhero on YouTube. 25. YouTube launched HD video in 2008 and full HD video feature in 2009. 26. YouTube's usage is increasingly increasing due to the increase in video content demand. 27. Men look more like YouTube than women. 28. The first video on YouTube with 1 million views was an Ad Video from Nike. 29. In 2007, the added feature was included on YouTube. 30. In 2007, British Prime Minister Tony Blair was the first leader of the YouTube channel. 31. According to a 2013 study, 60% of the Top 1000 YouTube videos are banned in Germany. 32. YouTube is banned in China since 2009 because China has strong restrictions on publishing the video. 33. The program that examines copyright content on YouTube is called Automated Content ID. 34. Despecito is the most searched video on YouTube, 32 million likes After this, See You Again is a music video. 35. In YouTube, we can see 360 videos. If you have not seen any such video then just search in YouTube and search 360 videos and watch. 36. YouTube has a premium plan that can be used to view videos without advertisements. It is not available in all countries. I believe that you may have learned all 36 Interesting Facts about YouTube. If you liked this post, then definitely share it on social media and if you have any question about this post then comment below.